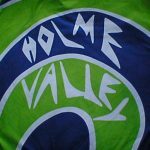 The Holme Valley Wheelers, is based in Holmfirth and the Holme Valley near Huddersfield. The club promotes participation in cycling and provides opportunities for coaching and competitive cycling to the local community. The club was founded in 1924 making it over 90 years old. The club is affiliated to Cycling Times Trials (CTT), Yorkshire Cycling Federation (YCF), Cycling UK (formerly CTC) & British Cycling (BC). Members of the Wheelers compete in different branches of the sport including Track, Time Trials, Road Racing, Cyclo-Cross and Mountain Biking. The club has a regular Sunday morning ‘club run’ and also from time to time, more specific leisure rides. The club organise a number of time trial events during the year, hold an annual cycling trip to Majorca & have a number of social events for members to enjoy. In 2012 the Wheelers promoted a 2-day road race for the first time. This event has been ongoing, in June, ever since and now includes a Ladies 2 day event. We also organise the Holme Moss Hill Climb, club hill climb plus 10, 15 and 25 mile time trials throughout the racing season. The Sovereign 10 mile Time trial series consists of a number of evening time trials and is as popular as ever with local riders. The club has 2 British Cycling qualified coaches who are available to provide guidance to members of all ages. Young members are encouraged to participate in a variety of local events including Track coaching, Hill Climbs, the White Rose Youth League, Cyclo-cross and their own points section in the Sovereign 10 mile time trial league. In the past the club has helped international riders on their way to success including current world and Olympic champion Ed Clancy.